WISE remote I/O & sensing devices bring an IT oriented spirit to the market with advanced concepts of data A-P-P (data Acquisition, data Processing to data Publishing), fulfilling mobile monitoring and controlling needs under an IoT framework. With intelligent processing and publishing features, users can quickly notice and identify possible issues and minimize system downtime. WISE offers a reliable source of big data, helping users to identify next steps and needed actions. The WISE-4000 series is an Ethernet-based wired or wireless IoT device that is integrated with data acquisition, processing and publishing functions. 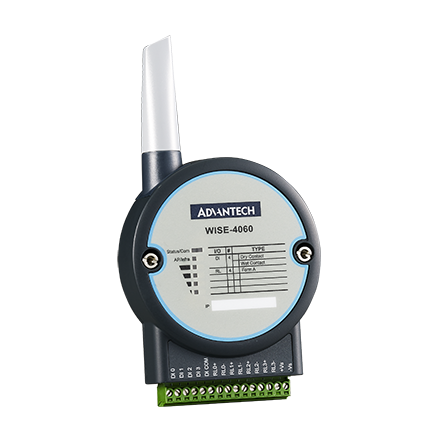 The WISE-4000 series provides data pre-scaling, data logic and data logger functions. Data can be accessed via mobile devices and published to the cloud. Broad adoptability has made WISE a reliable source of big data that benefits users in identifying their next steps and which action to take. To provide complete IoT sensing solution, the WISE-4000 series goes beyond providing a wireless communication interface for sensors—it also provides cloud connectivity for additional user applications. With support for IoT protocols such as REST and MQTT, the WISE-4000 series can communicate with cloud services or other web services via secure web sockets. The WISE-4000 series leverages MQTT—a publish/ subscribe messaging protocol for constrained IoT devices in low-bandwidth, high-latency, or unreliable networks—to communicate directly with the cloud or ERP/MES systems without a gateway or converter. Advancements in IoT have led to the development of many wireless technologies that can be implemented in various hardware products. The WISE-4000 series utilizes Wi-Fi, 3G, and LPWAN to meet specific wireless communication requirements.